I like the blue one , and by searching on the net I found blue Mach1 with black stripes / hood and other with silver stripes / hood..I find a few with other body colors (red..). Silver was an original color ? or is it a color used on restored / modified mustang ? Or was it only alvailable with some particular colors ? 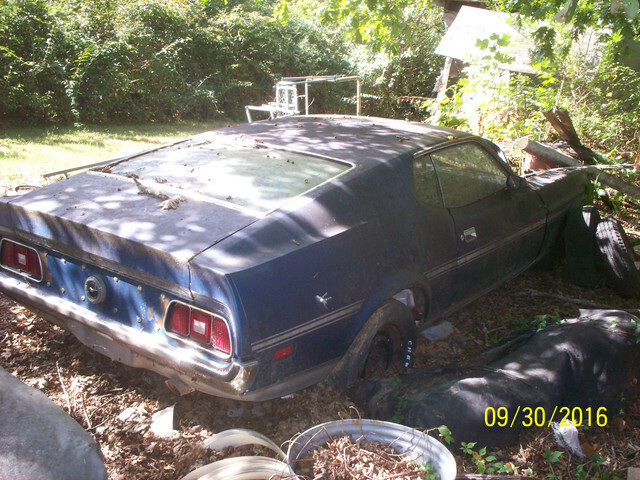 This is an original paint and stripe 1972 Mach 1 T-5 German model rusting away in my back yard, lol. Had 35,000 miles on it. It had Argent stripes from factory and Argent hood paint with locks. I do not think black came on the blue cars. But Ford would do anything you wanted if it did not concern EPA or crash testing. The argent stripes were not production installed on very many colors. For 1971 the argent stripes were used on color codes "A" (Black), "C" (Dark Ivy Green), "J" (Grabber Blue), "6" (Silver Blue Metallic). For 72/73 the argent stripe was used for "3K" (Blue Glow), "4Q" (Dark Green Metallic) and "4C" (Ivy Glow). Unless doing a concours restoration I would use what ever color you liked. 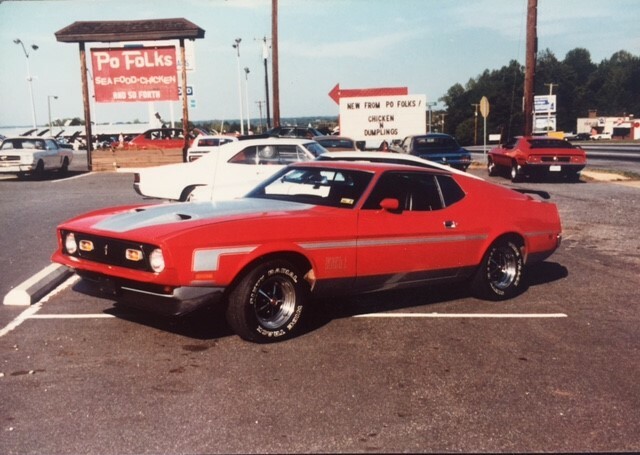 I saw a red Mach1 with argent stripes at a MCA car show and thought how good it looked and how Ford should have left the stripe and color choice to the customer! (07-18-2018, 10:06 AM)Carolina_Mountain_Mustangs Wrote: This is an original paint and stripe 1972 Mach 1 T-5 German model rusting away in my back yard, lol. Had 35,000 miles on it. It had Argent stripes from factory and Argent hood paint with locks. I do not think black came on the blue cars. 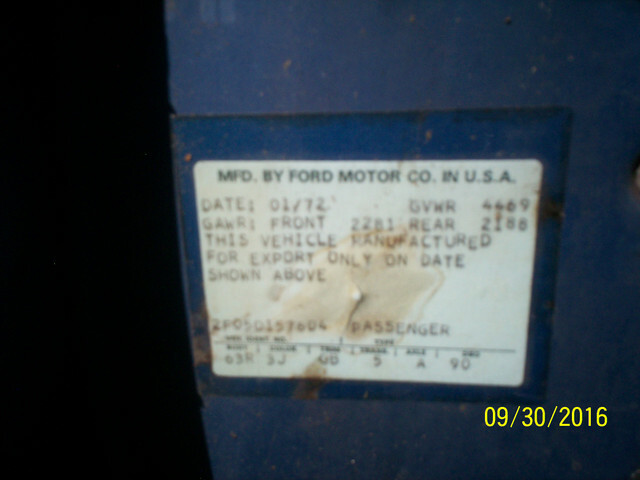 But Ford would do anything you wanted if it did not concern EPA or crash testing. Nice backyard... You announce the mileage in miles, does it mean that the T5 models haven't the odometer in km/h ? The Army solider that brought the car home changed it out to MPH. My friend that has a 65 T-5 had also had it changed. Difficult to find the KPH here. I guess they took out changed and tossed. It cost $1.00 to bring your car home from Germany I am told. (07-19-2018, 11:03 AM)Carolina_Mountain_Mustangs Wrote: The Army solider that brought the car home changed it out to MPH. My friend that has a 65 T-5 had also had it changed. Difficult to find the KPH here. I guess they took out changed and tossed. It cost $1.00 to bring your car home from Germany I am told. $1... wow, it will cost me more than 3000 euros ($3500)... to get a Mustang from the Us..
You need to join the US Army!